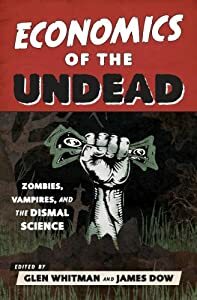 Economics of the Undead: Zombies, Vampires, and the Dismal Science is a collection of 23 essays, written by ourselves and many others, that apply economic reasoning to understand zombies, vampires, and the humans who share their world. And no, we don’t just mean metaphorical zombies and vampires — we mean the real thing. The book includes chapters on the investing secrets of wealthy vampires, preparation for economic recovery after the zombie apocalypse, optimal taxation of zombie labor, and the political economy of responding to undead threats (by the Volokh Conspiracy’s very own Ilya Somin). Why should we waste time studying the undead, especially when there are so many serious topics to consider? Although the appearance of academic articles, books, and even courses on the undead has mostly drawn favorable press, some critics argue that the opportunity cost is too high. The leading critic seems to be Michael Poliakoff, policy director for the American Council of Trustees and Alumni, who is cited in two recent articles on the subject. Michael Poliakoff … says the proliferation of undergraduate courses in topics like zombies and vampires is helping ruin American students’ brains. Citing various studies, Mr. Poliakoff says many U.S. college graduates still lack proficiency in basic verbal literacy. How do we respond to these charges? Our defense is two-fold. First, lighten up! Not everything in life is about eating your vegetables. Zombies and vampires are fun, and there’s nothing wrong with that. And for a certain type of geeky personality (that’s us), part of enjoying any product of pop culture is getting hyperanalytical about it. Sometimes we academics like to apply our training in less-than-serious ways. Rather than perceive undead studies as a bad investment, we regard it as good consumption. Second, and more seriously, we contend that — at least in economics — academics and the undead are complements, not substitutes. As instructors, we are constantly looking for ways to keep our students awake and engaged in the material, and often that means using humorous and provocative examples to demonstrate economic principles. Importantly, those principles remain unchanged. The supply-and-demand model is essentially the same whether applied to widgets (booooring), illicit drugs, or units of blood. Comparative advantage is the same whether applied to trade between the U.S. and China or between the living and the dead. In editing Economics of the Undead, we were scrupulous about making sure the economic concepts and reasoning were sound, despite the fictional subject matter. This defense might not work as well in other disciplines. If English departments have completely abandoned Shakespeare and Jane Austen in favor of the latest schlocky zombie novels, we concede that might be a problem. (Then again, maybe they’re assigning Pride and Prejudice and Zombies and getting the best of both worlds.) However, if the goal is to impart basic writing skills (Poliakoff’s concern), those skills can be learned by writing about pretty much anything. Why must English composition always be paired with (classic) English literature? If writing about vampires is what motivates students to write at all, we say more power to the vampires. As in all things, moderation matters. If zombie studies courses really are pushing out, rather than complementing, courses that teach important skills, then Poliakoff’s concerns may be warranted. But we are skeptical. We suspect the real opportunity cost of zombie studies courses is not basic required courses, but elective courses on topics that are equally pointless in terms of students’ long-term life prospects. How much good did that whole semester on Faulkner do you, anyway? (We sure hope you didn’t get your writing composition skills from The Sound and the Fury.) Moreover, devoting an entire course to the undead isn’t the only way to go; we haven’t yet pitched an Econ Undead course to our university. We think the best way to make use of the undead in the classroom is to integrate them into existing courses alongside other (more serious) examples, sucking students into the discipline by showing them the breadth of its possible applications. And did we mention that zombies and vampires are fun? This entry was posted on Monday, July 21st, 2014 at 1:49 pm	and posted in Uncategorized. You can follow any responses to this entry through the RSS 2.0 feed. « Are Zombies Labor or Capital?